As you do a little business realignment to prepare for the new year, give yourself a mental time out with this delightful book. I like to read a page from this book to start each day off in a peaceful mind set. If my day gets a little crazy, I calm myself with another 1 page read from this book. It's like taking a mini vacation to get perspective on what is really important in life. 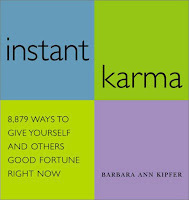 Barbara's web site ThingsToBeHappyAbout.com, provides a nice search tool to explore "Instant Karma". Below are some words that impact people, which you can click on to see how "Instant Karma" can redirect your current environmental thoughts and attitude for improved results. The search results will will be surprising and eye opening.